I don't want her to be just a Naga but something more bu still retain her Night Elf beauty, as well as the reptilian features that was the gift from the Old Gods. but I wanted to stay through to the original South Asian myth that the Naga is half snake, and also based on the southeast Asian myth that Raja Naga is a multi headed dragon. This design would make for an interesting raid encounter too! 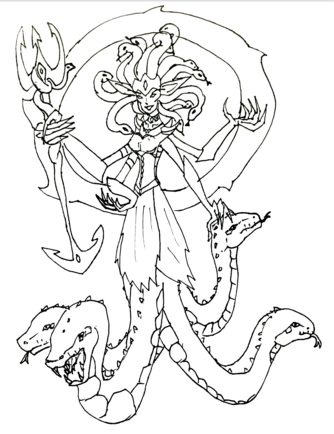 Phase 1 she is half in water so you dont see the snakes except they pop up Magera style. Phase 2 she comes up on land and you have to tank the snake heads as well as her. It could do a new Rag/Fallen Avatar-esque thing. I dig it! And the second phase sounds like it require multiple tanks, which would be interesting.